Sadly, this season of our lives is coming to an end. I am thankful for all the great memories that we made this summer, and I hope the boys will have lots of bright, happy memories to look back on and remember about it. However, I believe we are ready to move forward and welcome the cooler temperatures of fall and all the fun that will bring. 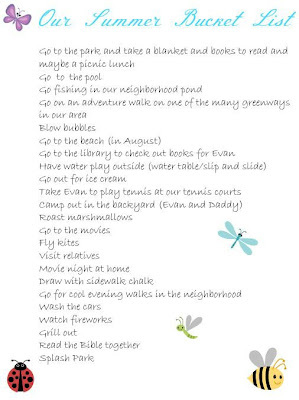 Since I made a Summer Bucket List, I thought it only appropriate to follow up with how we did on our list. I think we actually did quite well. Although we didn't hit every item on the list, we did manage to accomplish most of it. 1. Go to the park and take a blanket and books to read and maybe a picnic lunch. Well, we didn't do the blanket and book, but we did go to the park! 2. Go to the pool! Yes, we did this quite a bit, and Evan even learned to swim! 3. Go fishing in our neighborhood pond. Oops, here's one we didn't do! Maybe we'll add this one to our cooler fall list. We did walk to the pond though. 4. Go on an adventure walk on one of the many greenways in our area. Well, we didn't get to this one either although we did do some walks in our neighborhood. 5. Blow bubbles. We did do this at home, but I only captured pictures of the bubble blowing at Wonderworks in Myrtle Beach. 6. Go to the beach. Yes!!! Yes!!! Yes!!! 7. Go to the library to check out books for Evan. *Sigh* The only trip we made to the library was in early summer when we stopped at the Matthews library while daddy gave a speech at the Town Hall. 8. Have water play outside. *Sigh* We would have done this and gotten out the water table more if the bugs weren't so flippin' bad and if it hadn't rained almost every day of summer. 9. Go out for ice cream. I know we did this several times here and at the beach, but I can't seem to locate a post about it. Sadly, I may not have gotten pictures. 10. Take Evan to play tennis at our tennis courts. I think Eddie and Evan did this at least once, but I don't have any pictures to prove it. Evan still wants to take lessons. 11. Camp out in the backyard. Well, even when I added this one, I knew it would likely have to wait until cooler weather. Plus, it has been entirely to wet with too many bugs. 12. Roast marshmallows. Again, likely a fall activity. 13. Go to the movies. That we did! Evan got to see Despicable Me 2 and Turbo, and we all went to see Percy Jackson Sea of Monsters. 14. Fly kites. Ugh, too rainy! This is probably a better spring activity. 15. Visit relatives. Yes, we did, and we had some visitors too. We actually just visited Great-Grandpa for his 84th birthday, but I haven't done the post yet. 16. Movie night at home. We watched so many movies this summer. It's kind of crazy actually. We switched from cable to AT&T's service for a better rate and got some great movie channels. Plus, we are loving using Amazon Prime to stream free or cheap movies and shows (got to finish Downton Abbey's last season!). I can't even list all the movies we've watched although Evan watched a ton of old '80's movies with me this summer. It was awesome! 17. Draw with sidewalk chalk. Well, sadly we didn't do this much either for the same reason we didn't do most of the outdoor activities. Recently, I did the boys' first day of school chalk writings, and after that, Brody brings me the chalk and wants to go and draw. Hopefully, we'll do this more this fall. 18. Go for cool evening walks in the neighborhood. Yes! 19. Wash the cars. Yes, the boys loved this one! 21. Grill out. Sadly, we didn't do this too much. Eddie used the grill a few times, but we didn't hang out outside for the previously mentioned reasons. 22. Read the Bible together. Not nearly enough! Stay tuned for lots of fall fun. Fall is awesome in the Carolinas! I'm pretty sure that you posted a picture of you guys eating gelato. That's ice cream. Am I right? That was you, right? I know you ate crepes, but I think thre was gelato too. And you're right. A lot of the missed activities will be good for fall. Especially the roasting marshmallows. Yum. We did gelato, but I don't know if I put the picture in a post on here or not. Probably just on facebook. And crepes...yum! I'm very hungry right now! ;-) Yes, let's roast marshmallows and make s'mores! You got a lot done. We always think we'll have so much more time to do things than we actually have. At least, that's what I find. The important thing is that you created a lot of wonderful memories for your family no matter what you did, or didn't, get checked off your list. I think I'll have to make a fall bucket list now! I really enjoyed reading about how y'all spent your summer!